Quickline is exceptionally pleased to have been introduced to Unisurge by literally stumbling across this project whilst on a site visit to a client occupying an adjacent unit! We were briefed by a member of the Unisurge management team following their very recent acquisition of an 80,000 sq ft building in Normanton. In order to respond to their expansion plans the company were just starting the process of setting it up a second Distribution Centre and process site to serve the North of England. We immediately got to work with the challenges of the project. Unisurge is a leading manufacturer and supplier of practitioner-specified procedure packs (CPT), dressing packs, medical disposable and theatre products to healthcare professionals. As NHS Trusts are seeing a reduction in storage capacity Unisurge must ensure that they can work with customers to offer a delivery solution to ease this pressure and also support their commitment to offering the best service possible to meet the individual needs of their customers. There were various aspects to the work that Quickline recommended and subsequently installed. The first challenge was the fact that the existing mezzanine floor in the building was insufficient in size and needed extending. 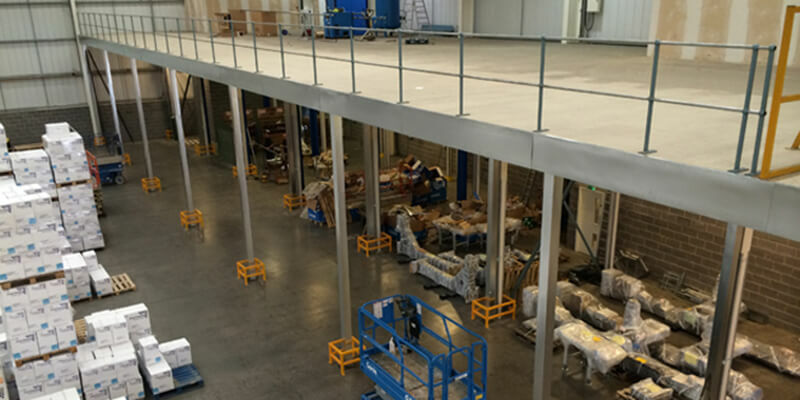 The mezzanine was 40m x 6m overall in size and was 6m to the finished floor level. As the storage platform was butted up to the existing floor we relocated the handrails and pallet gates to suit the new layout. To ensure the best possible finish we took the decking back through to the existing floor so that there were no seams, and we pride ourselves on this aspect of the project as it is an area where some fit out companies would be tempted to cut corners. In addition to the mezzanine floor we specified and installed 3,000 pallet locations of Narrow Aisle Pallet Racking.